Over the past ten years, actor Carolina Ravassa has had numerous roles in short films and TV shows. She also has lent her voice to a few video games such as Max Payne 3, GTA V, Just Cause 4, RDR2, and most notably, Overwatch. As an Overwatch voice actor, Ravassa plays the purple-haired Talon hacker Sombra. Earlier this year, at Katsucon, she played Sombra in real life. 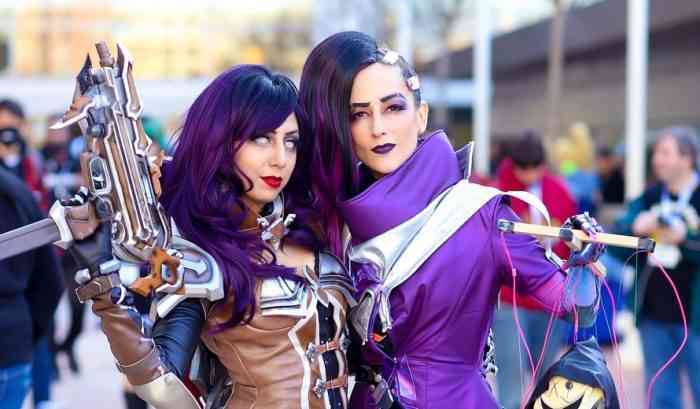 Her cosplay was created by Melanie Jasmine, who also often cosplays as Sombra. The two got together for the event and gave us a double dose of the Mexican hacker. The Carolina’s outfit has a bodysuit-base with the coat over top of it. The costume is made up of a combination of spandex, pleather, vinyl, and epoxy resin casts. Melanie Jasmine documented the entire day at Katsucon starting with make-up and costuming in the morning. They went on to an Overwatch voice actor panel with Widowmaker’s Chloé Hollings. Much of the day included running into fans and selfie and photo ops, complete with nose booping. You can view the entire video #SOMBRAFICATION below. Encounters with fans included other Sombras, where Ravassa performed a quick mirror bit with. In another instance, she met “Jeff Kaplan” Overwatch director who spun a wheel of chance and nerfed her. Ravassa and Jasmine also round off the day with a private photoshoot of the two Sombras, with a little Reaper marionette cameo. Do you like it when voice actors embody their characters in real life? Let us know in the comments below.